By Dan Grennan | March 1, 2017. Bakers Lounge is the ideal spot for St. Patrick’s Day festivities. 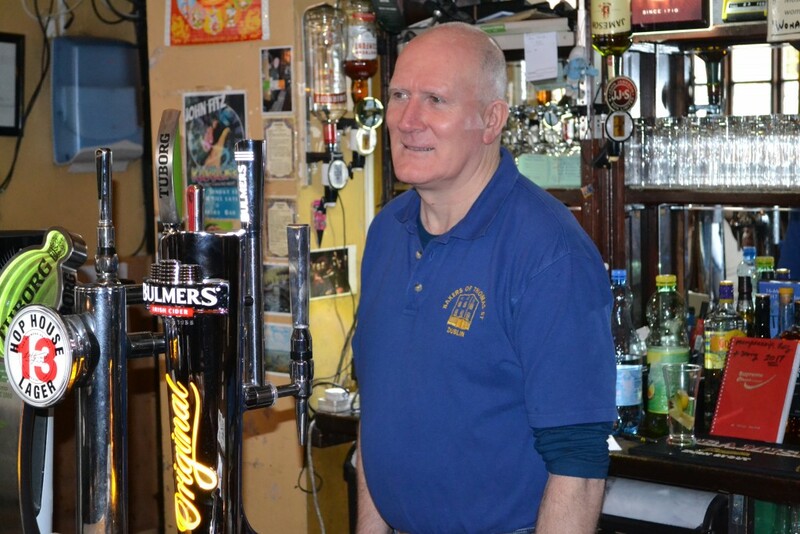 Publican John O’Connor will be doling out the best pints of black stuff in the city all day, with great live music in one of Dublin’s most charming pubs. The Liberties is absolutely rammed with events throughout March. From St. Patrick’s Cathedral to District 8, there is something for everyone. Kicking off the first March weekend in Vicar Street is Comedian Jason Byrne, performing his brand new show ‘Propped Up’ on the 3rd and 4th of March. Jason always delivers a good time with his own brand of hyper active surrealist comedy. At €23 a ticket you can’t go wrong. Dutch house DJ duo, Detroit Swindle are giving a 4 hour long set in District 8 on the 3rd of March and promise to deliver an epic set of house, boogie and disco. If getting down on a groovy Tuesday isn’t your thing, why don’t you make your way down to Christchurch for a candlelit film screening every Monday at 6.30pm throughout March. For more information on this event, check out Roisin Chapman’s piece later in the paper. Des Bishop is taking over Vicar Street on Friday and Saturday the 10th and 11th of March with his show ‘One day you’ll understand’. District 8 is having a big weekend with Bicep playing on the 10th and fan favourite Gorgon City playing on the 11th. St. Patrick’s Day weekend 2017 is going to be a smasher in the Liberties. And With the chaos that goes with St. Patrick’s Day weekend it is good to have a plan. Here is a list of the cream of the crop events. If you are looking for a cultural and historical tour of Dublin in regards to St. Patrick himself, look no further than the ‘In the footsteps of St. Patrick’ walking tour led by renowned Dublin historian and author Pat Liddy. The tour starts in St. Andrews lane and includes admission into St. Patrick’s Cathedral. The tour is on all weekend (16th to the 19th) and is a must-do for all history buffs and tourists alike. There will be a pop-up Gaeltacht in Dame District (between Dame Lane and Court) the day before Paddy’s Day at 8.00pm. Perfect for a cheeky pint and a bit of craic as Gaeilge to kick off the weekend’s festivities. American singer-song writer Cat Power is playing a gig in Vicar Street on Paddy’s Day eve which promises to be a tremendous show and a perfect way to groove into the Paddy’s Day weekend. If you are looking for a trad session on Paddy’s Day there is no better spot than renowned traditional music pub The Cobblestone at the top of Smithfield square. District 8 is hosting an all day party on Paddy’s Day with Tale of Us taking the headline act. There will be two stages, one indoor and one outdoor and it starts at 2.00pm and ends at 10.00pm. Perfect if you want to throw shapes all day. Al Porter is doing his new show ‘At Large’, which will have all the cheekiness, truths and showmanship that comes with one of his comedy performances. There is a Festival Treasure Hunt on the Saturday of Paddy’s Day weekend which is a great way to discover some of the most beautiful and historic sites in Dublin while unleashing your inner adventurous spirit. The adventure starts at City Hall and takes an hour and forty-five minutes to complete. There is also a smaller trail for kids! The Bernard Shaw is hosting The All City Street Art Jam on the Sunday of Paddy’s Day weekend. The main event is a graffiti jam with everything from craft beer to vintage clothes. Combine this with Dublin’s hugely popular EATYARD and you are guaranteed a fabulous day out.